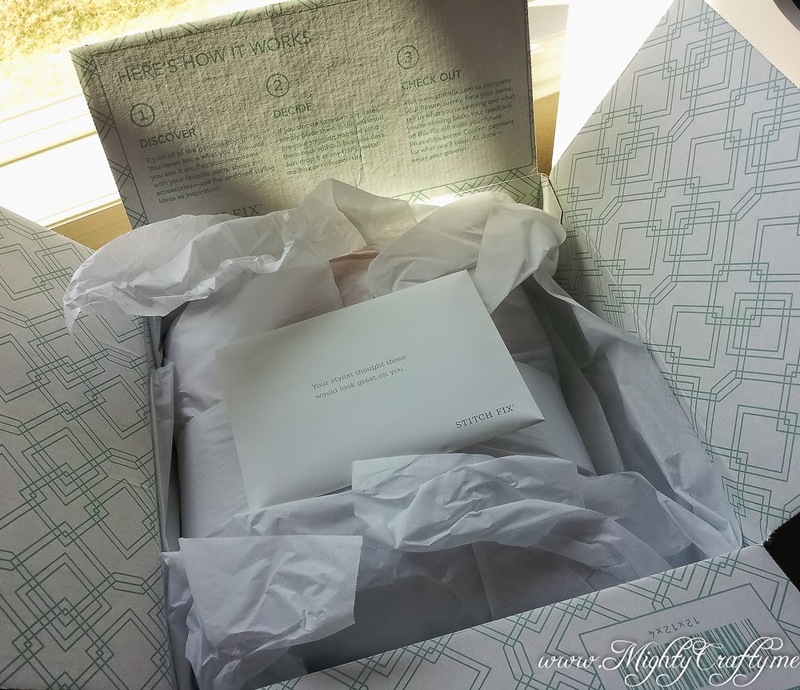 If you haven't heard of Stitch Fix, it's a monthly subscription box service. You pay a $20 styling fee and fill out a detailed style questionnaire -- then the Stitch Fix stylists pick out five clothing and accessory items to send you. 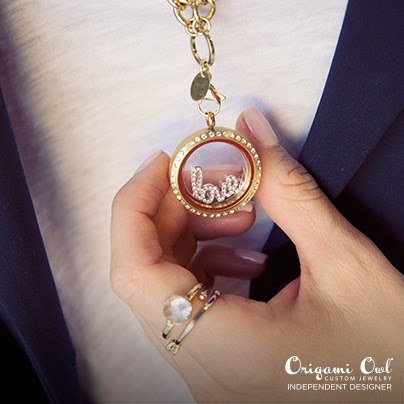 You keep only what you love and send the rest back in their pre-paid shipping envelope. 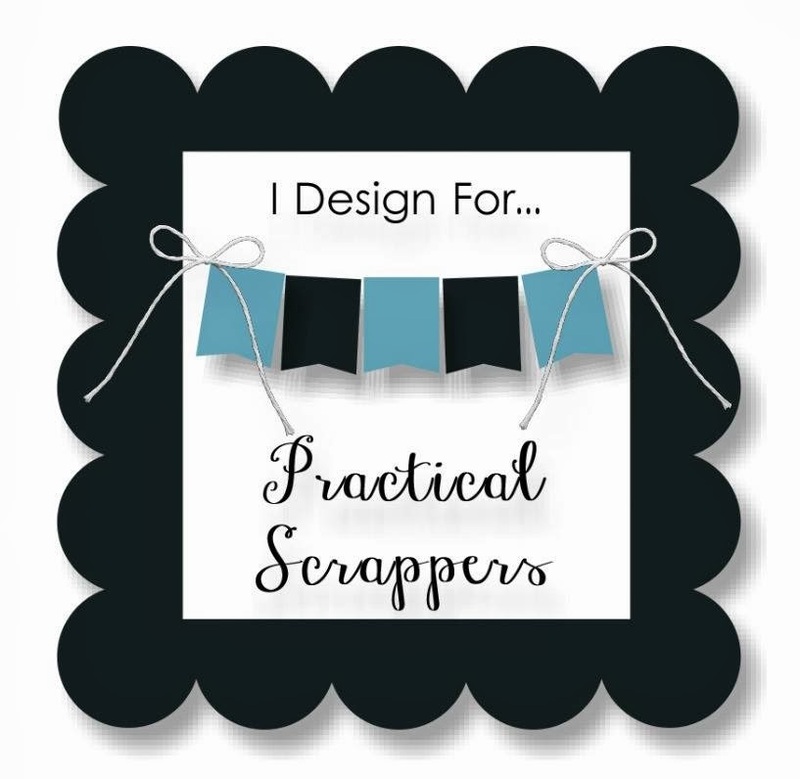 Your $20 styling fee is applied as a credit toward what you keep -- and if you keep all five pieces, you get an additional 25% off the total. 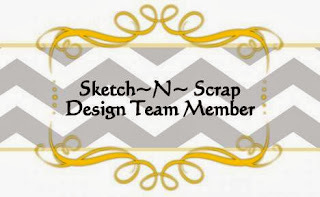 Another benefit of these monthly Fixes -- I no longer have those incurable impulses to pick up random clothing items from Target and Kohl's. 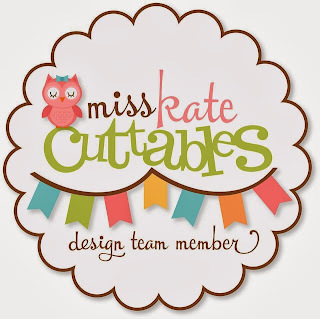 My monthly fixes are kind of pricey to pay all at once, but I think I'm saving money in the long run by not impulse buying every time I go to Target. :) And the clothing sent by Stitch Fix is super top quality -- I can already tell it's going to last me so much better than any cheaper random clothing purchases. Win! 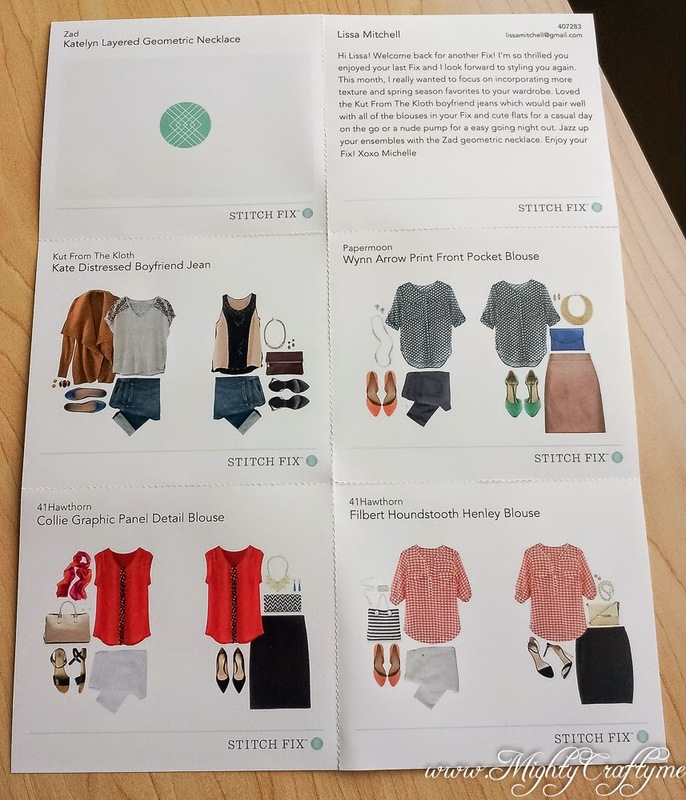 I love that Stitch Fix sends these wardrobe cards for each item in the Fix. I keep them in my closet so I can remember how to pair everything up. Love that. So, on with my April fix. It was so fun to try everything on. First up -- another pair of awesome jeans. I swear, I don't know how they do it! I loved, loved, loved these Kate Distressed Boyfriend Jean by Kut From the Kloth ($78). So amazing. Love the little distressed patches and the fit is perfect to wear with tall boots or flats. Kept! Next was this Wynn Arrow Print Front Pocket Blouse by Papermoon ($48). 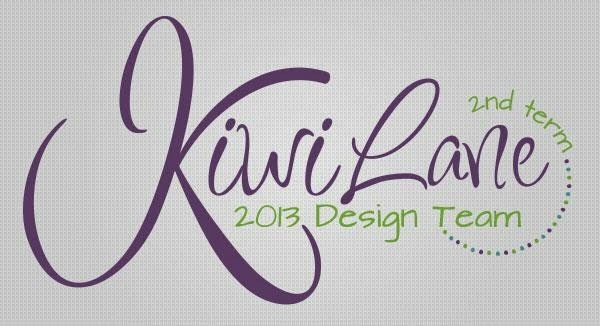 I loved the pattern and colors of this shirt, but the top pockets and the high neckline just made it not the most flattering top for my girls. I sent this one back, reluctantly. Third was this gorgeous sleeveless top -- the Collie Graphic Panel Detail Blouse by 41Hawthorn ($48). I absolutely loved the color and the vertical stripe detail on this top (it was on the back too). But since it was sleeveless, and since my arms aren't my best feature, this top was just not for me. Maybe after I get buff arms, I can request this top to come back to me. I sent this one back too. 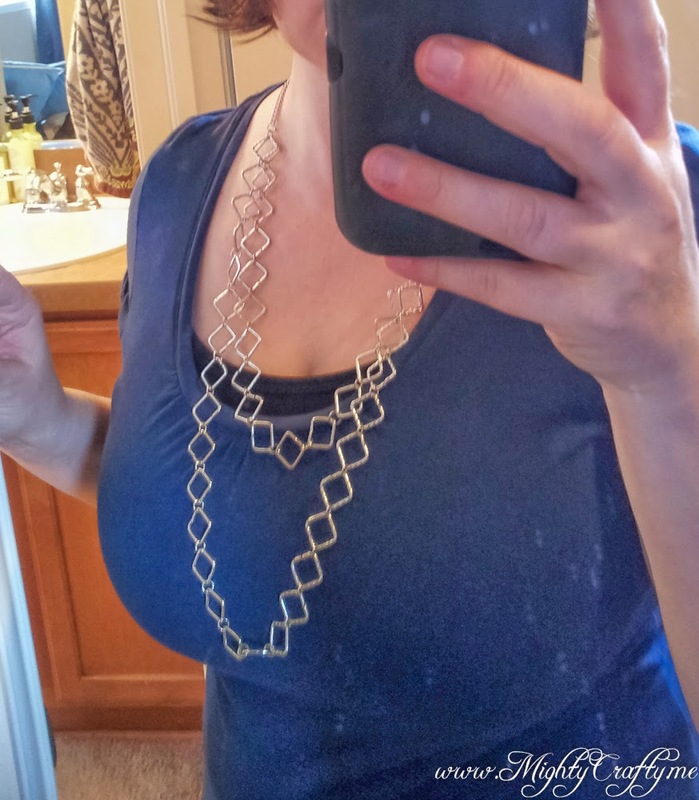 Fourth, this Katelyn Layered Geometric Necklace by Zad ($34). It was cute, but I didn't love it. I sent this one back too. Finally, this Filbert Houndstooth Henley Blouse by 41Hawthorn ($58). Again, loved this color! This is a super cute top. I really wanted to keep it, but I already had a red version of this same top (which I love). And since at this point, I was only keeping the awesome jeans, I decided I would send this one back too and save up my budget for my next fix instead. Whah. So, I only ended up keeping one piece from this Fix -- the jeans. Love those! 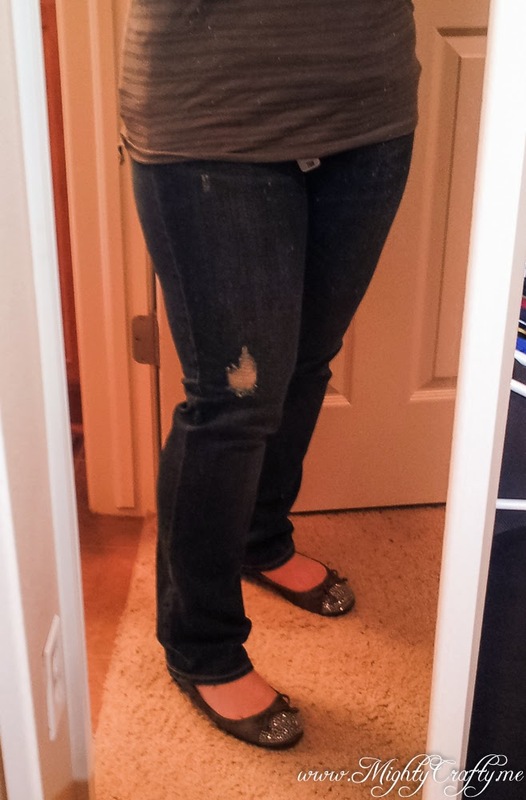 I still can't believe how well Stitch Fix has done for me with jeans/pants. I NEVER find jeans to fit me, and every pair they have sent, I have loved and kept. Wow. 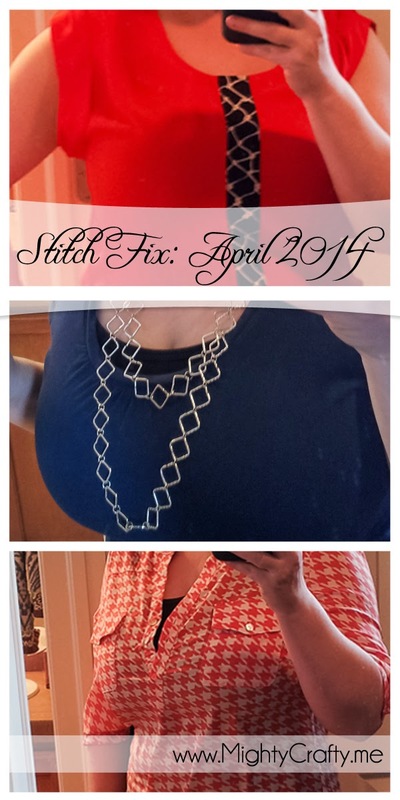 So, even though I sent back four of the five pieces, I still LOVED getting my Stitch Fix this month. I can't wait until the next one. If you are looking to update your wardrobe with fashionable pieces, this is the subscription service you need to try.